Abstract: This paper studies the comparison of two kinds of port regulation modes - the centralization mode and the decentralization mode - using principal-agent theory and dynamic game theory. 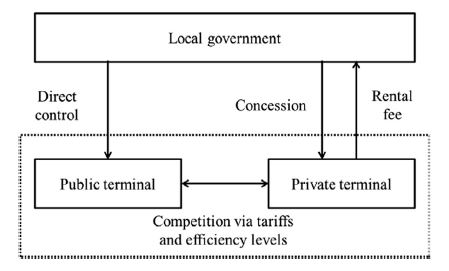 The optimal tariffs, port capacities and port efficiency levels under these two regulation modes are determined. The theoretical results are applied to the container terminals in Port of Shanghai in China. Sensitivity analysis and comparative studies show that the tariff, port efficiency level, port service demand and social welfare are higher under the decentralization mode, while the impact to port capacity and port operator's profit with different port regulation modes is uncertain. Reference: S. Zheng, R.R. Negenborn. Centralization or decentralization: A comparative analysis of port regulation modes. Transportation Research Part E: Logistics and Transportation Review, vol. 69, pp. 21-40, September 2014.